Set in the heart of the historic city, this hotel is just moments away from Amsterdam’s famous shopping streets and cultural heritage sites. This prime location is close to the city center and next to Centraal Train Station. Guests can indulge in three tempting dining options, including the stunning 11th floor SkyLounge Amsterdam. Accommodations include modern and stylish guest rooms and suites with array of amenities. 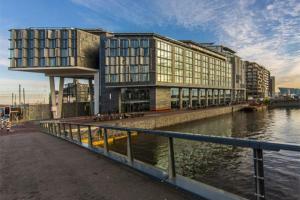 Set next to Amsterdam Central Railway Station, overlooking the River IJ and city centre.